I am a changed woman. I cooked up my first batch of bacon in the oven and I'm never going back to the pan again. Less clean up, less fat, less wrinkle. It was overall awesome. As you may already know, I rarely have bacon in the house. It's not the greatest thing for you and it's pretty expensive so it doesn't make it's way here very often. A couple times a year though, I'll grab some if it's on sale just to make the boys happy. What is it with boys and bacon? I haven't met one yet that didn't like it. Anyways, my son knew that there was some in the fridge and he asked if he could have it for dinner tonight. With green beans. Very odd. But since he gets tons of nutrition from other food throughout the day - and we don't have it very often - I said he could. I figured I'd make a BLT for myself while he munched away on a few pieces. We had seven pieces left in the package so I just made it all. He ate five. Since I was making so much, I thought I'd save time and give it a go in the oven. I was always curious to see how it would turn out so it was the perfect time to take the plunge. Like pretty much everyone else, I always stood over the stove for what seemed like forever while cooking bacon in a pan on the stove until it became shriveled up little, three-bite pieces of grease. It was just how it was done, right? Well...no more! This easier way lets you leave that bacon alone and not flip it constantly or get splattered with hot grease or have it sit in it's own fat. It's perfect when you need to make a lot or even a little and you can adjust the cooking time depending on your preferred doneness. The best part about cooking is this way? It stays flat. No more wavy bacon! As my three year old said, "Mmm. Crunchy and delicious! Mmm. Chewy and tasty!" 1. Line a shallow baking sheet with foil. 2. Place a baking rack on top - preferably one that has the lines that cross each other. (see picture below). 3. If it isn't non-stick, give your baking rack a light spray with non-stick cooking spray. 4. 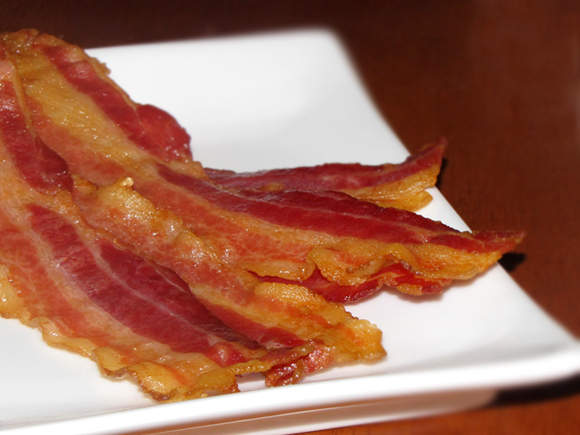 Lay bacon directly on the baking rack in a single layer. 5. Place the rack in oven and set the temperature to 400°. 7. Check the bacon after about 20 minutes or so and cook it until it's done to your liking. I cooked mine for 28 minutes.